The latest addition to Cooler Master’s HAF range is a weird ol’ beast, but we can’t help but have a soft spot for its techie aspirations. There is no real form factor that the HAF XB fits in with – indeed, it almost seems to have created its own. The closest comparison we can make is with the bizarre, though equally endearing, Antec Skeleton. You see they’re both as close to a consumer-focused PC test bench as you can get. In our day-to-day working life we are jamming in and tearing out components from the review machines on a regular basis, so we generally work on an old open Intel test bench. And that’s probably the reason we’re so enamoured by the HAF XB – strip the top and sides off and this thing gives you almost unfettered access to your main components. This is thanks to its odd design, footprint and form factor. The HAF XB is no desktop, HTPC, full or midi tower – it’s a case that feels absolutely massive thanks to almost cube-like design and is unlike any other chassis out there. 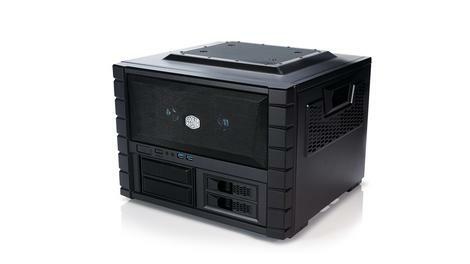 You can buy test benches if you like – Cooler Master even does its own open air bench – but the beauty of the HAF XB is that when you’re done messing around switching in and out parts you can close it all up and you’ve got an enclosed PC again, with all the focused airflow and noise-dampening that entails. It also means your test bench can be used as a proper PC easily too. But that’s an incredibly tight niche to be focusing the chassis at, and if you’re not going to be playing around with your PC’s innards on a regular basis there’s little point to picking up the HAF XB over another of the HAF family of PC cases. The scale of the HAF XB means that it’s not really going to sit comfortably under your desk, or on top of it either, it’s just too awkwardly sized. It’s not an entirely practical chassis to use either, even if you are completely taken by the cuboid aesthetics. The fact it’s only got space for a pair of 3.5-inch drives in the quick-release X-Dock, and yet has a curiously high number of 2.5-inch bays, makes for a strange design decision. The back of that X-Dock is also a little tightly pressed against the PSU when you’ve got a relatively large unit installed – which can be especially awkward if you’re using a modular supply. And yet we’re still rather taken by it, in a very geeky kind of way. We like the way the motherboard straps onto a tray that can be removed with a couple of thumbscrews, giving you easy access to the rear for cooler-stripping/mounting fun and full access to the PSU and storage drives sat below it. This tray also makes for simple cable-routing too, leaving the main part of your PC clean and easy to get stuck in to without fighting your way through a mass of cables. But we have to be, at least, slightly objective and say that for most users the HAF XB is not a particularly practical chassis. But if you’re a serial system tweaker – with your PC regularly sat missing its side-panel or just regularly in pieces on your carpet – then this could well be the chassis for you.